I long to accomplish a great and noble task, but it is my chief duty to accomplish small tasks as if they were great and noble. – Helen Keller. 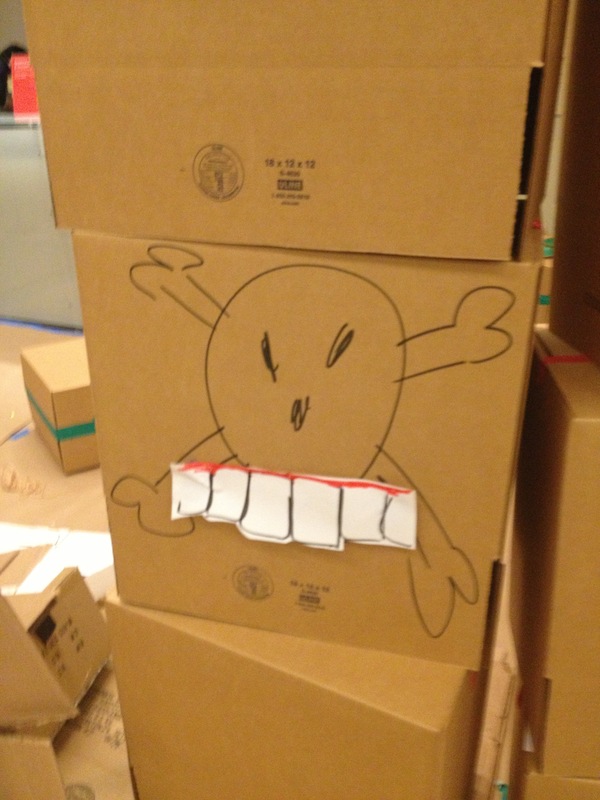 I set this rule for myself: if I took a task out of the box, I had to do it. There was only one I failed to complete. get 5 people in the room- horrified, I had to go up and talk to a bunch of people in the reception room, innocent people getting glasses of water and cups of coffee and planning out their teacher activities for the evening. find someone with same initials and make friendship bracelets: “What are your initials?” I asked ten people. Without success, I began saying, “What letter does your name start with?” Finally a guy said to me, “My name could be Edward Smith,” and I said, “Oh!” “But it’s not,” he said. “I don’t know that,” I said. His friend “was a Girl Scout,” and volunteered to make one friendship bracelet, I imitated hers. 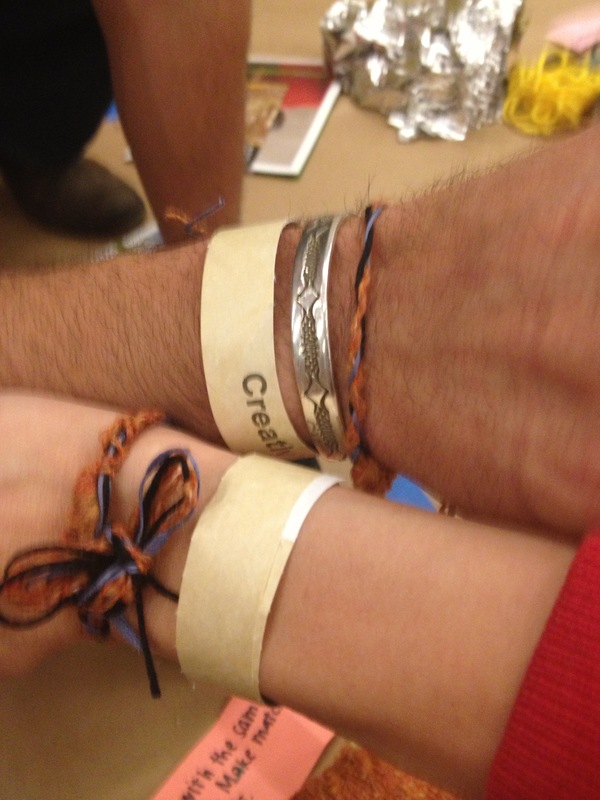 She tied her bracelet on my wrist, and mine on his. 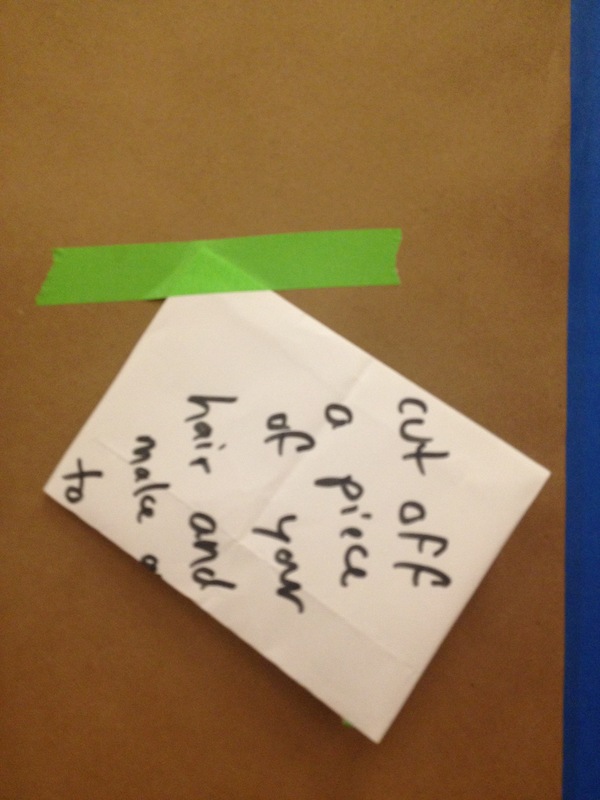 cut a piece of your hair and make an envelope to put it in: a task I assigned. This felt a little Yoko Ono. I found it completed and taped to the wall. 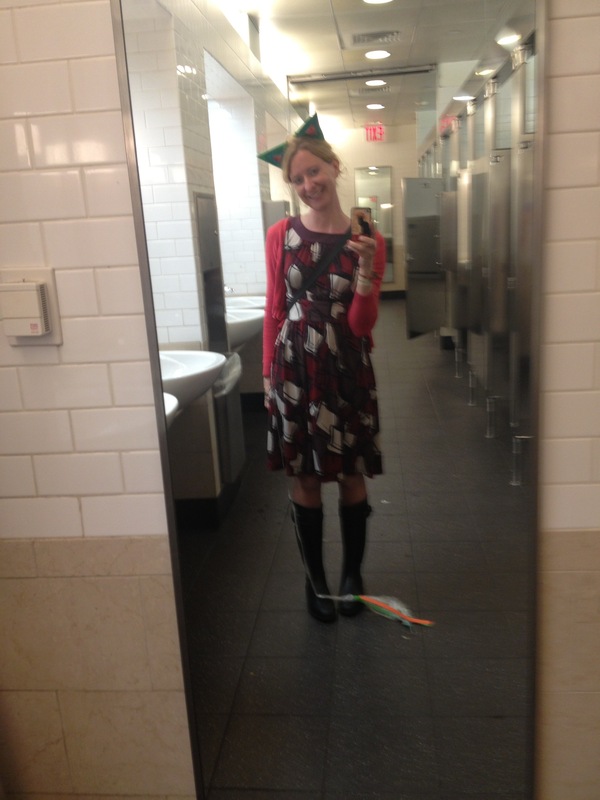 This is called a TASK Party.” Really it was two of the happiest hours of my life. Everyone is good at something, I am good at TASKs. I can’t thank artist Oliver Herring enough. pour a glass of water and pour it in the toilet. I wondered if this one got done. This also felt a little Yoko, I wish I knew if anyone did it. add teeth to something- found that task of mine completed later (in the mouth of a skull and crossbones I had drawn for another task). 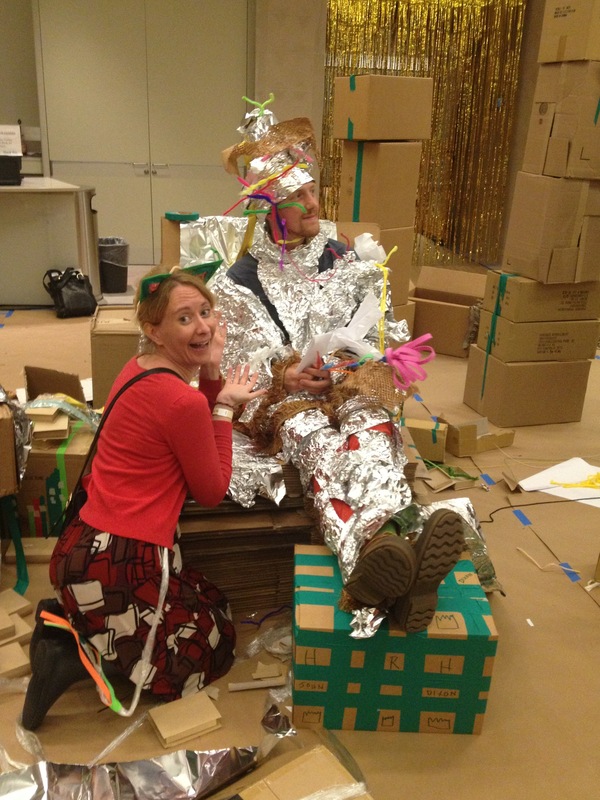 In the room, we had: a huge rolls of paper, tinfoil, piles of unassembled boxes, pipe cleaners, wire, markers, painter’s tape in many colors, tons of regular white paper for drawings and tasks, scissors, hole punches, fabric, ribbon, foam sheets, styrofoam trays. 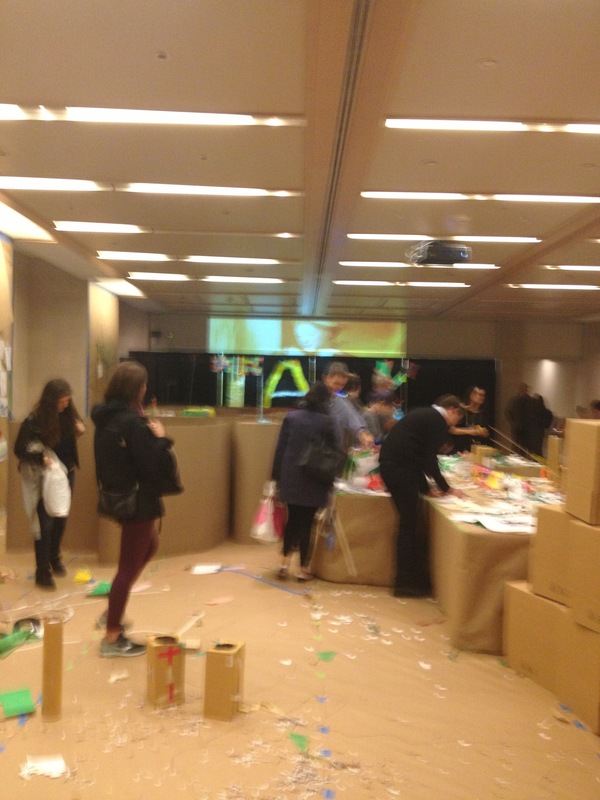 This TASK Party was part of the Metropolitan Museum’s Educator workshops. There were other events at the Met that night for teachers, but I didn’t go listen to ideas for lessons or write in a gallery, that’s all well and good, this was better. get everyone to hide- I asked the DJ to cut the music, yelled out, “They’re coming! They’re coming for us! Everybody hide!” Everyone took a minute to process, then they kind of got, again, where we were and the rules, and they all hid. do 10 squats and dance for 2 minutes- I drew this one twice, and my thighs are sore. create a conga line- I always enjoy this, although a lot of people don’t know how to conga. It is one, two, three, kick. 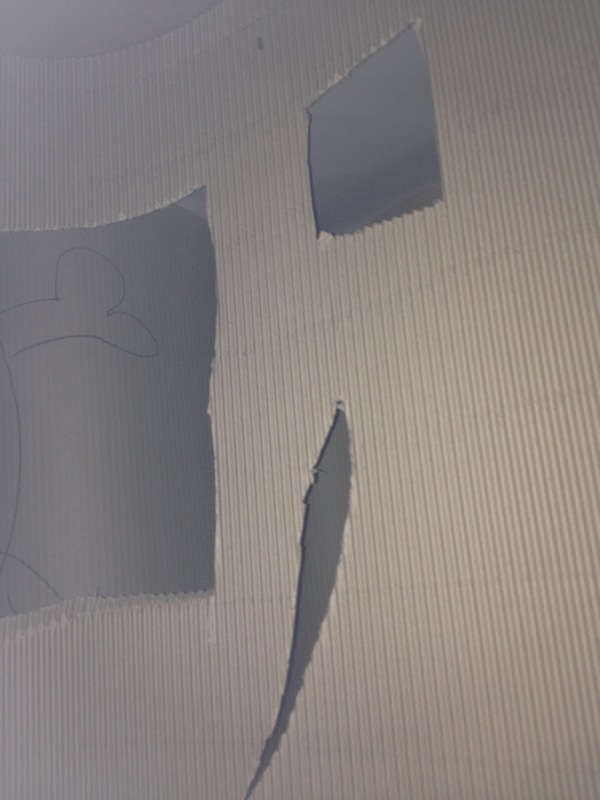 The room for a TASK Party is set up with materials, and the floor and walls are covered with paper. My personal rule was also to write one task and take one task, except for one break I took to just write a bunch of tasks. make a beautiful moment- I took a video exactly one minute long, of our creation. Video link in case the embedded doesn’t work. Why was this so magnificent to me? I was drunk with it almost immediately. I loved the parallel play of it, parallel play is hard to find, as an adult. Where you can be alone and together. This is why I am at my writing space in Brooklyn, I suppose, right now, parallel playing. make ears and a tail and wear them- I went with foam ears, pipe cleaner supports, pipe cleaner inner ears, plastic for my tail, with a sort of ending flourish like an elephant’s tail, made of several colors. At the end of the evening, I stopped for a slice of pizza, and when I turned around, a delivery guy was holding my ears up to his chest like it was a bikini top. “Oh, those are mine,” I said. “They’re ears,” I explained, holding them up to my head, as if that explained anything. Especially being a generative and solo-working artist, this is an invigorating change. I believe strongly in the need for play, and the need for artists to make things quickly, being silly, spontaneous, to help us stay flexible and fresh, for our harder, mopier, hands-to-the-plow work (for me, writing a novel, editing for the millionth time, or submitting things a million places). find the purple haired girl and make her laugh- at the time I drew this, I could not find the purple haired girl. This was the only task I failed at. tell a knock knock joke- I approached a woman and said, “Knock knock.” “What do I do?” she said. She had an accent. “You say, ‘Who’s there? '” I said. Now I was thrown. I had intended to do banana/banana/banana/orange, but she clearly had no understanding of the knock knock genre. “Who’s there?” she said. “Orange.” “Now what do I say?” “You say, ‘Orange who? '” “Orange who?” she said. “Orange you glad I didn’t say ‘banana’?” I said. “Thank you,” she said politely. She was there a long time, she was a good sport. When it was over, the DJ played “Last Dance,” which, as always, made me so sad. I was hoping he was just playing that, it didn’t mean it was over, although our numbers had dwindled. I would say 30 of us, maybe 40, had been in there when it was crowded, but the last half hour or so there were the core of us, maybe 15, doing each others’ tasks. knock down the wall- sadly, no one did. add color to the maze- I wrote that one, and overheard a lady who worked at the museum saying, “It said add color, does this look good?” reminding me that sometimes people who work in the arts need support to be creative themselves, poor dears. touch the ceiling- this was tough. There was a shopping cart that I stood on, it did not get me too close. I got some styrofoam meat trays and started ripping them in half and taping them together to make a long pole that would touch the ceiling. add a roof to the maze- I wrote this one, and was pleased to see the artist doing it himself. An expected joy was being told to make stuff, that directive, and the time and space to do so, makes me so happy. The unexpected joy was noticing, realizing, my task was being done, or had been done, someone else was getting joy from my idea. That was amazing, in a different way from my usual experience of that. 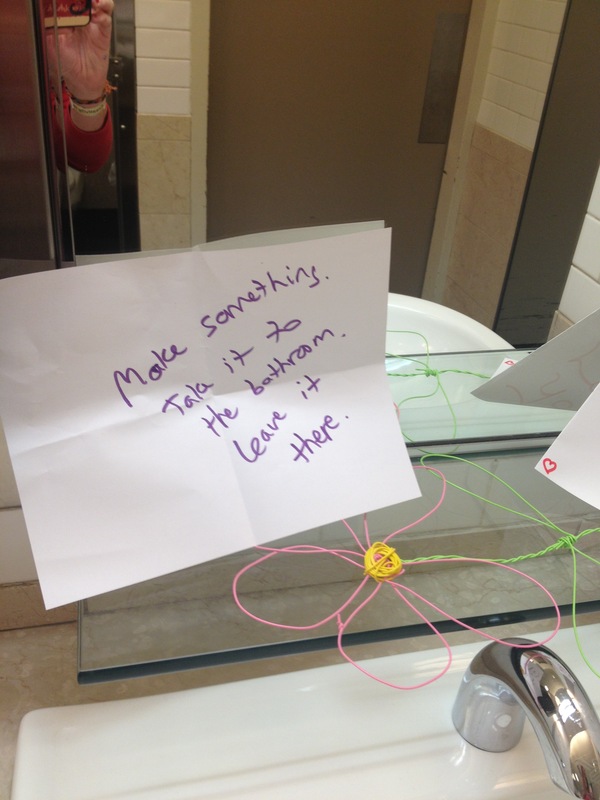 make something and leave it in the bathroom- later I saw it, when I went in to smile at yourself in the mirror, another task. find 10 objects and write a poem about them- I eventually saw the poem. 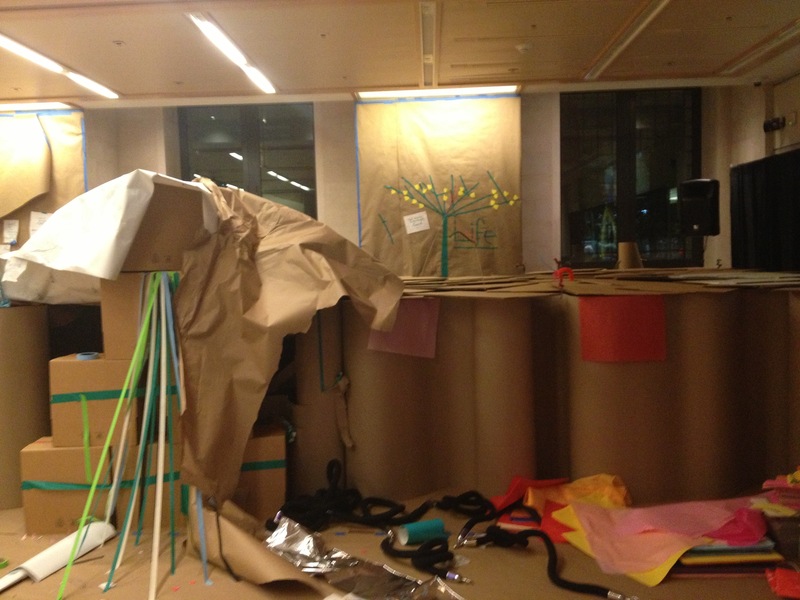 People also built robots, gardens, a pile of “burning” books, all manner of hats, and wings. “It gets harder to think of something, doesn’t it?” someone said, and I said, “Yeah,” but actually I felt like I could have written tasks all night, I was going like gangbusters. find someone who is from close to where you are from- everyone I asked was from faraway places, suburbs of New York City I had never heard of. hold your breath and jump 10 times- I saw several people take this one, it made me laugh. make someone king of Belgium- the DJ stopped for this announcement. Further tasks dealt with the king’s presence. write laws for Belgium ASAP- I got a huge piece of paper, bigger than me, and wrote our laws: Don’t do this, do that. Don’t do this, do that. Don’t ever do that, do this. With arrows from one to the other, everywhere. I create things for people to do all the time, being a teacher. Sometimes they enjoy them, make great things from the assignment, but enjoyment isn’t the goal at school, of course. In this space, it was only for joy. ask everyone if they prefer coffee or tea- my task I enjoyed helping with. create a giant check and give it to someone- I assigned this but did not see it done. make a present for someone- This was my last task. I made a fortune teller with tentacles made of someone else’s drawing of polka dots and gave it to the grey haired guy with glasses, one of the people as committed as I was to our creation, he had also been there the whole time.